Bugaboo pram? Check. Il Tutto nappy bag? Check. Designer duds for baby? Check. Now, finally, here’s a high-end baby sling to add to the official Babyology must-have list for all those mummies who like a little luxe with their nursery gear. Take a deep breath and gaze in awe at the rather stunning and undeniably sophisticated Artisan sling from Sakura Bloom. The sling uses a tried-and-true ring fastening system to keep baby close but what sets it apart from any other ring sling we’ve seen are the sumptuous fabrics. 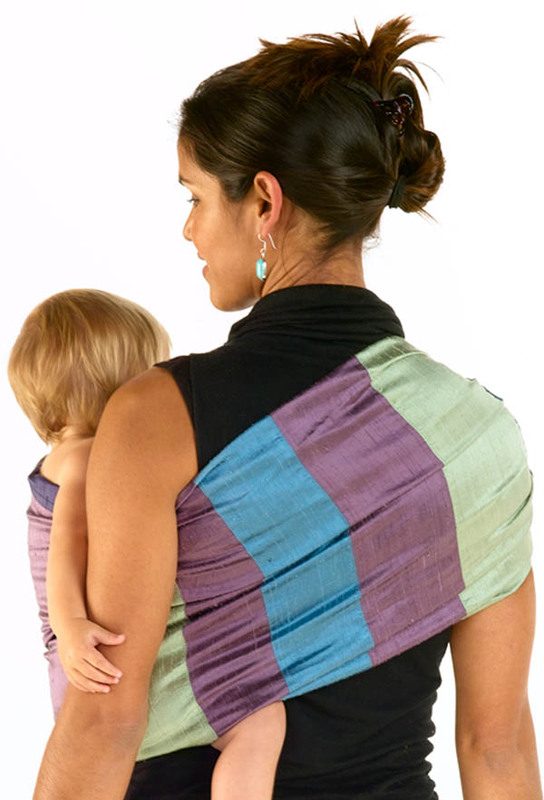 Made from the most incredibly soft and luxurious handwoven dupioni silks, we think you’ll agree that the Artisan sling takes the beautiful art of baby wearing to elegant new levels. The sling is reversible, with at least three contrasting shades woven in to the design to give Sakura Bloom its trademark style. And forget what you thought you knew about silk – these slings can be thrown in the washing machine whenever they need freshening up. Just remember to use cold water on a gentle cycle! The silk fabric also means they will mould to your body for a perfect fit so there’s no fussing about sizes. Sakura Bloom also has a range of Organic slings that are made from pure organic linen edged in the same dupioni silk for a baby-sized touch of luxury. Sakura Bloom slings are exclusive in Australia to Tribe. Organic slings are $150 and Artisan slings are $299, with free delivery.